The rulers of Upper Egypt won, and they reunified the country about 2000 BC, with the capital first at Thebes in the south, and then in a new city just south of Memphis. The Pharaohs of this period are not as powerful as before. They show themselves as taking care of their people, instead of as god-kings as in the Old Kingdom. During the time period of the new kingdom, pharaohs were all powerful, and pharaohs were all buried in the same geographic area called the Valley of the Kings. It was during this period that the written language was regularised in its classical form of Middle Egyptian. The first body of literary texts was composed in this form, although several are ascribed to Old Kingdom authors. The most important of these is the “Instruction for Merikare,” a discourse on kingship and moral responsibility. Trade flourished, arts and literature flourished. 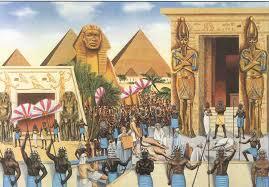 Egypt built strong armies to defend herself against her neighbors. During the time period of the middle kingdom, pharaohs were expected to be good kings and wise rulers. This period is marked by immense industrial development, building, literary masterpieces, and general prosperity in the country. Recognizing that the succession of the pharaoh was important to the continued stability of the country, this dynasty began a long series of co-regencies to facilitate the succession to the throne. Several new fortifications were built under Senusret III (about 1872-1853 BC) to secure a slightly more southerly border at Semna in the Second Cataract; the king headed several campaigns against Nubia. Egypt’s immediate interest in Nubia would have been its wealth of raw materials, such as gold and copper. Other materials desired by the Egyptians, such as hardwood and ivory, were traded through the region. Mentuhotep II made military campaigns in Nubia, which Egypt had lost by the 1st Intermediate Period. So did Senusret I under whom Buhen became Egypt’s southern border. Mentuhotep III was the first Middle Kingdom ruler to send an expedition to Punt for incense. He also built fortifications at Egypt’s northeastern border. Senusret instituted the practice of building of monuments at every cult site and paid attention to the cult of Osiris.